Ugandan children start secondary school after passing the Primary Leaving Certificate, which they take when in the equivalent of our Year 8, so they start secondary education much later than we do. They take GCSE equivalent exams (UCE) after four years and A levels after six. 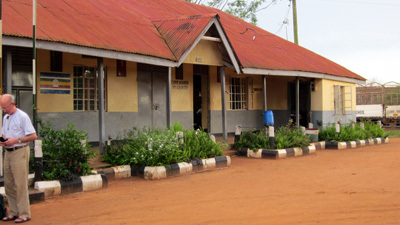 Many of the sponsored children attend Mityana Modern School. We are currently trialling other schools such as Trinity College, Royal Giant and a few others. The schools are reasonably well equipped with libraries and science laboratories and academic children can succeed well and progress on to college and university. Secondary schools are partly funded by the government who pay the teachers' wages but no other costs are covered. The education for less academic children is more of a problem as, like all such schools, much of it is just talk and chalk combined with rote learning from the children's own notes copied down from the blackboard. If children consistently fail to make progress over several years at secondary school we usually suggest that they leave to do a vocational course at a specialist college or as an apprentice. When children transfer from primary school to secondary school we ask for a one-off donation of £70 to buy the essentials for equipping them for secondary school eg PE kit, lab coats etc. The cost of sponsoring a secondary student in 2020 is £300 a year or £25 a month. This will provide a year's school fees, a pair of shoes, shoe polish, a school uniform including sportswear, pens, pencils, paper, exercise books, maths equipment, a school bag, a broom, soap and toilet paper. The schools insist on the children bringing all these things to school. The school fees pay for a lunch for the student and for a mug of dilute maize porridge at break time in the morning, often the first food or drink they have had since the previous evening. A few of our secondary children board at school. They are children who live far away or with a frail grandmother or have big problems at home. We are very grateful to their generous sponsors who pay £450 or more for them.